Absolutely pretty and fair well mannered educated below 28 from a decent family sought by B/​G professional parents closer to Colombo for their only son handsome IT Engineer working in America US PR holder born 1984,​5’10”,​. Differences immaterial. Reply with TP number. E-mail: r​a​d​a​k​a​r​u​@​y​a​h​o​o​.​c​o​m​TP: 011 2789844. Academically and professionally qualified pretty daughter is sought by B/​K parents living in New Zealand (over 40 years) for their academically and professionally qualified son Barrister and Solicitor,​born in 1990. Holds a double degree. He is a Senior Solicitor in a leading law firm in the capital. Citizens and persons currently living in NZ and Australia preferred. Please reply with family details and horoscope to: k​k​g​@​x​t​r​a​.​c​o​.​n​z​. Academically and professionally qualified well-mannered kind hearted daughter below 27 yrs.,​sought by Govi/​Buddhist parents living in USA for their 5’11’’,​handsome son,​US citizen,​Science graduate,​currently working pursuing post graduate studies. Please reply with family details and copy of horoscope too. E-mail: a​b​a​y​a​z​p​r​a​g​@​o​u​t​l​o​o​k​.​c​o​m​parents will be flying to Sri Lanka next week on holding for a couple of days. Contact number 011 2727523. Colombo suburbs Govi Buddhist handsome son born 1968,​height 5’7” reputed businessman legally separated from first marriage owns house and property,​vehicles,​bride below 40 years is sought,​must be very pretty and have a horoscope compatible to Siyawasa Nekatha. s​w​a​r​n​a​p​a​l​a​6​1​@​g​m​a​i​l​.​c​o​m​0114884261. Sinhala Buddhist parents seek a pretty educated girl under 35 years for their youngest son MSc finance qualified Business Analyst vice president level living and working in UK British citizen. Reply with copy of horoscope to u​k​p​r​o​p​o​s​a​l​1​2​3​4​@​g​m​a​i​l​.​c​o​m ​Please only reply by email. 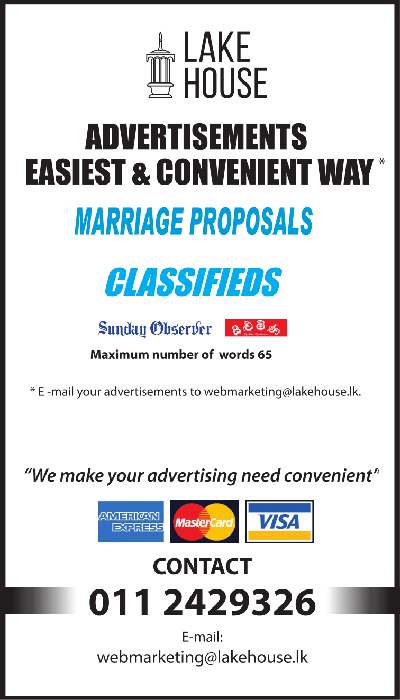 Sinhala/​Buddhist/​Govi professional business family is looking to introduce an educated slim beautiful daughter,​not less than 5’5” in height,​age below 25 with a good family background and essential qualities,​to our only son - a Civil Engineer,​5’9”,​currently working overseas with a 6-figure salary,​and owning luxury vehicles and property,​inheritance worth over 170 million. Only sister is an Attorney. Kindly send all particulars to: s​l​p​r​o​p​1​s​t​@​g​m​a​i​l​.​c​o​m​including a scanned copy of the horoscope and links to social media. Information will be treated with utmost confidentiality.